Through this research, we learn that camu camu is antiviral -- it helps kill viruses that could threaten your immune system and is a powerful protective agent against colds and the flu. It is anti-arthritic, so it can help reduce inflammation, which tends to ease the pain of arthritis. And it's anti-atherosclerotic, which means it can help prevent atherosclerosis, or the buildup of plaque in the arteries. Plaque in the arteries leads to serious heart disease and eventually heart attacks. It can help prevent the buildup of plaque to protect you from the foods you may be consuming that tend to cause the buildup of that plaque (such as fried foods or processed foods made with hydrogenated oils). 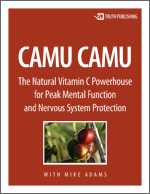 Camu camu is also known as an antidepressant. This is not surprising, given that depression is often the result of a suppressed or poorly functioning nervous system. Of course, depression can have many causes, but the most common is actually a malnourished nervous system. Depression is not, as conventional medicine claims, a chemical imbalance in the brain that has to be corrected with prescription drugs. It is typically just a nutritional deficiency that can be corrected through diet by eating natural foods. The camu berry is one of the natural strategies you can use to reverse depression, even serious depression. Camu berry is also documented as being anti-gingivitic, which means it helps fight gingivitis, the gum disease that can affect dental health. Next, camu is described as anti-hepatitic, meaning it protects against liver disorders, including liver disease and liver cancer. This is not a surprising effect, given that antioxidants are protective of the liver in general. Being a potent antioxidant, it can help support the liver's efforts in detoxifying many of the chemicals to which you are exposed. Today, in the Western world, we are exposed to so many outrageous chemicals. Most consumers expose themselves to literally hundreds of dangerous chemicals through the use of hair spray, shampoo, hand soap, laundry detergent, cologne and perfume. In fact, there are over 20 known carcinogens in most perfumes sold on the market today. Those perfumes are illegally marketed in violation of FDA laws because they don't carry cancer warning labels, but that's a loophole that the FDA is not currently enforcing. The fact that your liver is detoxifying all the chemicals you're exposing yourself to is one of the primary reasons the camu berry can help your liver stay healthy.